visage|SD K™ FaceAnalysis package includes cutting-edge machine learning algorithms to estimate gender, emotion and age. 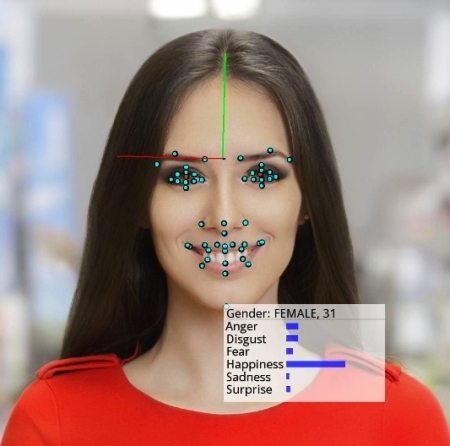 FaceAnalysis works with FaceTrack to find/track faces in images or video, and then uses state-of-the-art techniques to accurately provide the user with gender, emotions and age for the faces in roughly frontal position. Basic emotions are included: happiness, sadness, surprise, anger, disgust and fear, and additionally neutral. Since the algorithm returns the probability of every basic emotion, more complex emotions can be estimated as a combination of the basic ones. Gender estimation provides the user with male or female estimation. Age estimation gives approximate age of the user.